The original Mario Bros. game for arcades was released in 1983. Mario and Luigi worked together to clear the sewers of all sorts of bad guys. The co-op in that game was quite good, even by modern standards. The Mario Bros. series has remained incredibly popular through the years, spawning all sorts of sequels. The franchise is legendary, and for good reason. But one thing that has been missing from most Mario Bros. games is co-op. The latest game in the series, New Super Mario Bros. Wii, goes back to Mario's roots in co-op, allowing four players to join together to beat Bowser and rescue the Princess. A few years back, Nintendo released New Super Mario Bros. for the DS system, and this game shares a lot with its portable predecessor. New Super Mario Bros. Wii isn't a remake, though, and there are many new elements that set it apart. The DS game was excellent, probably one of the better titles for that system, and New Super Mario Bros. Wii doesn't stray too far from the things that made it work on the DS. 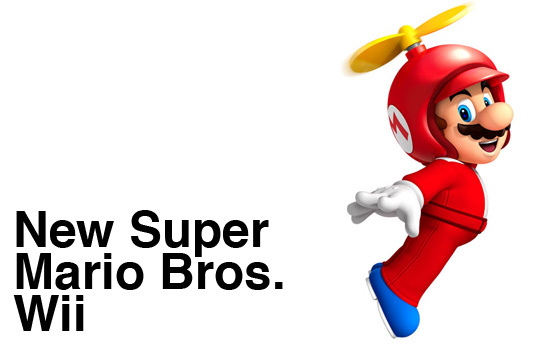 Though the title of the game would suggest otherwise, New Super Mario Bros. Wii is a return to "old school". The action takes place in a 2D perspective, unlike the previous Wii title Super Mario Galaxy. If you played any Mario Bros. games on the original NES or the Super Nintendo, you will feel quite at home here. Mario begins each level in tiny form, and collects the familiar power ups. The growth mushroom, fire flower, and invincibility star all make appearances. Bricks are bashed, coins are abundant and ready for collection, and pipes with piranha plants are scattered throughout the landscape. 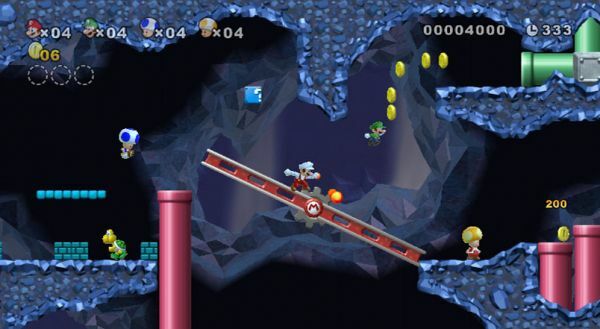 For fans of classic Nintendo platformers, New Super Mario Bros. Wii is a real treat. Though there is much "old" about the game, there are several innovations. One is the Ice Flower, which allows Mario to shoot balls of freezing cold. Enemies struck by the ice balls are encased in ice, and can be picked up, thrown, or simply used as a platform to jump on. As you can imagine, this is extremely useful. Even better is the latest in the long line of suits for Mario, the Penguin suit. This snappy looking costume allows you to slide on your belly in a quite adorable manner, which is great for hopping over small pits and such. Mario doesn't slide on icy surfaces while in Penguin form, and it allows you swim quite proficiently too. The Propeller Suit allows you to leap to incredible distances with a waggle of the controller, allowing you to reach special areas and avoid dangers below.